An in-depth insulation energy audit is a perfect service to add instant value to your company and provide immediate profits to your customers. A Certified Insulation Energy Appraiser’s audit can pinpoint areas for improvement in a plant or facility often overlooked in traditional insulation maintenance programs. These areas can provide enormous energy savings! 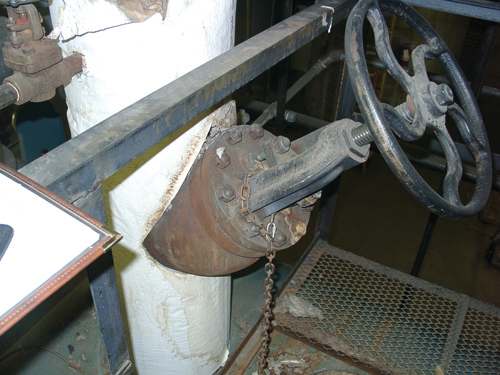 For example, Photos 1 and 2 show un-insulated steam valves and one 90-degree elbow. They are installed high off the ground, eliminating a personnel hazard, and condensation is not an issue, so these areas went unnoticed for years. Installing 2-inch-thick fiberglass insulation saved the customer $216 and 41,000,000 Btu per year. By itself, it may not appear that exciting, but consider how many steam valves, unions, and other fittings are un-insulated in the same facility: 50, 100, 1,000? Depending on the facility’s size, the savings quickly become impressive. To further illustrate the benefit of insulation on the “forgotten” parts of a facility’s mechanical system, a recent audit was performed for a major university as a primer for future energy projects. One mechanical room contained 33 un-insulated steam valves. The facility managers wanted accessibility to the valves for maintenance reasons, so instead of fiberglass pipe insulation, removable insulated blankets were fabricated with ceramic insulation. In that one mechanical room, the university saved over $13,000 and 431 million Btu per year, with a payback period of 2.5 months. Another audit performed in a maximum security facility uncovered substantial savings from just repairing insulation or adding thickness. Over 2,200 feet of steam piping from 1/2 in. to 14 in. was found to have damaged or partially removed insulation, as well as insulation not thick enough for the system. After correcting those problems, the facility is realizing savings over $24,000 and 5.3 billion Btu per year. The return on investment for this project was estimated at just under 1 year; however, follow up with the facility put the actual payback at 6 months. 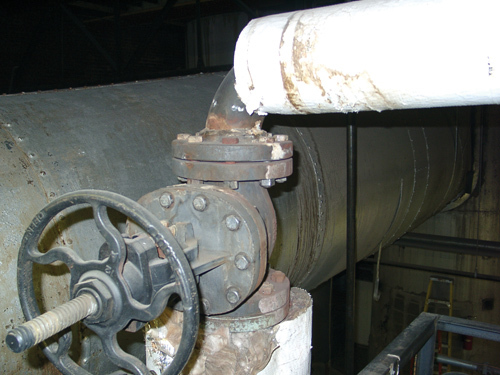 At a manufacturing plant, an energy audit uncovered savings from repairing an existing steam loop 20 feet in the air with multiple drops to machinery on the floor. Most of the steam piping installed 8 feet and below was damaged from foot and forklift traffic and presented a substantial burn hazard for employees. On the high portion of the loop, simply repairing fiberglass and insulating valves was needed. Closer to the floor, calcium silicate insulation with an aluminum jacket was used to better protect the insulation from damage, also resulting in fewer hot pipes accessible to employees. The savings amounted to just over $64,000 and 9.9 billion Btu per year. Not only did this audit pinpoint and eliminate a huge safety hazard, but it also provided a 6-month payback period. For customers in heavy industry, the savings can be amazing. An audit was performed on two large hot storage tanks with a history of problems maintaining temperature, resulting in an inconsistent product. Fiberglass 2 in. thick with aluminum jacket was figured for the sides and tops of both tanks. Each tank was over 100 feet in diameter, so the savings added up quickly. In one year, this facility’s savings was $2,300,000 and 214 billion Btu. Imagine walking into a customer’s site and being able to add $2.3 million to their bottom line year after year. As more facilities strive to become greener, an energy audit can also help eliminate substantial amounts of greenhouse gases from production processes. In April, the Environmental Protection Agency formally declared that carbon dioxide (CO2) and five other greenhouse gases are pollutants that threaten public health and welfare. A Certified Insulation Energy Appraiser’s main tool, the 3E Plus® program, can determine emissions savings from CO2, NOx, and CE. As an example, the case studies above save over 26 million pounds of CO2 per year. The first step to find a Certified Insulation Energy Appraiser in your area is to visit the National Insulation Association’s website (www.insulation.org). Under the “Insulation Training & Resources” title is a link to the Insulation Energy Appraisal page. From there, you can click on a prompt to search for an appraiser by state, country, name of appraiser, or company name. Certified Insulation Energy Appraisers have passed a thorough, 2-day class with in-depth training on the 3E Plus® program, conducting on-site inspections, collecting and analyzing data, and presenting the information to the customer. A detailed energy audit can mean days of inspection and data collection. The more accurate the information gathered up front, the more accurate the data presented to the customer. Two key tools that go above and beyond the normal instruments required to do a detailed “take-off”: a laser temperature gun and a thermal imaging camera. The temperature gun can provide the appraiser instant feedback on the true temperature of the system, as well as quickly and easily finding thin spots in existing insulation. Thermal imaging cameras can take a snapshot of an area to quickly pinpoint where the heat is escaping. Thermal imaging pictures create wonderful “before” and “after” pictures to visually prove the power of insulation. The detailed report should be well written, containing neatly labeled pictures of problem areas (with thermal images, if available). Depending on the relationship with the facility manager, the report should be sent up the chain of command, preferably to the director of capital projects or a chief financial officer. The more people with authority who see the report, the better the chances that the recommendations will be implemented. Btu and dollar savings are so high that customer becomes skeptical. Every obstacle is a chance for the appraiser to show his or her training and experience in the insulation field, as well as how professionally obstacles can be overcome. For example, the appraiser can quickly overcome the first two obstacles listed above by creating a fillable PDF form that allows the customer to enter his own fuel cost. With the correct math loaded into the form, the payback period can adjust automatically with the rising and falling of fuel prices. The customer can put hypothetical figures into the document, making it completely dynamic, instead of a printed report with outdated information. When the customer refuses to give specifics about the facility environment (or does not know the details), the Internet is a great resource to find average fuel costs, average wind speed and temperature, and historical averages of many other variables. Some appraisals that uncover remarkably high savings may encounter skepticism from facility personnel, especially when the payback timeline is short. Again, with a little software knowledge, the appraiser can create a form that displays the potential Btu savings. All the customer needs to do is enter the fuel cost. The facility’s engineers can verify the math and run the calculations themselves, if need be. The ultimate skeptic may not believe the appraiser’s Btu savings calculations. If that is the case, the appraiser can provide the facility with a detailed take-off from the on-site inspection and have the engineers run heat loss calculations according to ASTM C680 (the same standard the 3E Plus program uses). Generally, if the appraiser has a good working relationship with the facility manager, and a proven track record of performance on site, such measures will not need to be taken. The Insulation Energy Appraisal Program is a wonderful tool to offer customers. The power of insulation presented in a detailed energy appraisal can help all facilities, small or large, increase their bottom line and decrease their environmental impact.